Author’s note: This review is for the original fenix. 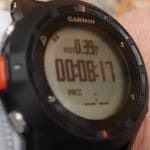 While Garmin has recently released the fenix 3, many of the core features found in the fenix are still applicable for the fenix 2 and 3. For a full rundown of differences between the watches, read this article. The fenix and fenix 2 have also been reduced in price (although they are still awesome watches!). Click here for the latest price of the fenix; here for the fenix 2; and here to check the price of the fenix 3. 100 yards into my run. I haven’t even broken a sweat. And while I should be focusing on the punishing climb ahead, I can’t help but stare at my wrist. 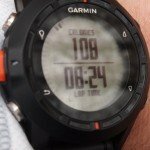 Clocking in at just under 3 ounces, nearly double the weight of the Forerunner 10, Garmin’s smallest watch, the fenix is Garmin’s heaviest. At nearly 2 inches in diameter, it’s not the largest. But it’s heavy. And I can feel it with each swing of my arm. My shoes crunch on the gravel as I turn onto the dirt road at the base of Mt Beacon. 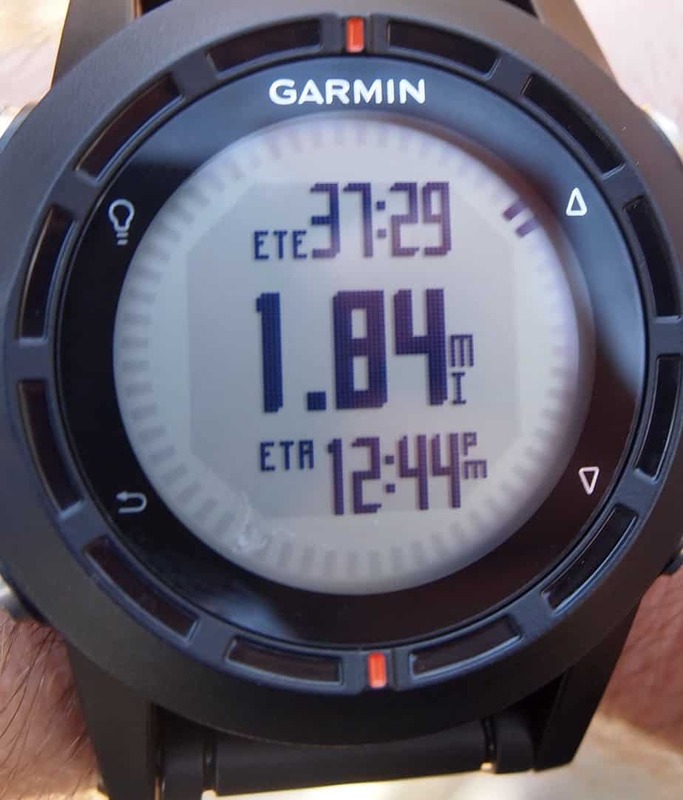 I quickly scroll through the fenix’s screens: time/distance/pace, last lap/calories – here’s the one I need. Elevation. 452 feet. Under “Profiles,” the running profile was easy to find. But unlike the Forerunner series, there are no dedicated Stop/Start or Lap/Reset buttons. Instead, the fenix instructs you (and luckily, this message appears directly on the screen) to hold down the “Up” button to start, and later pause, the timer. Then, hold down the “Down” button to mark a lap. Pushing the “Up” and “Down” buttons will otherwise scroll between data screens. 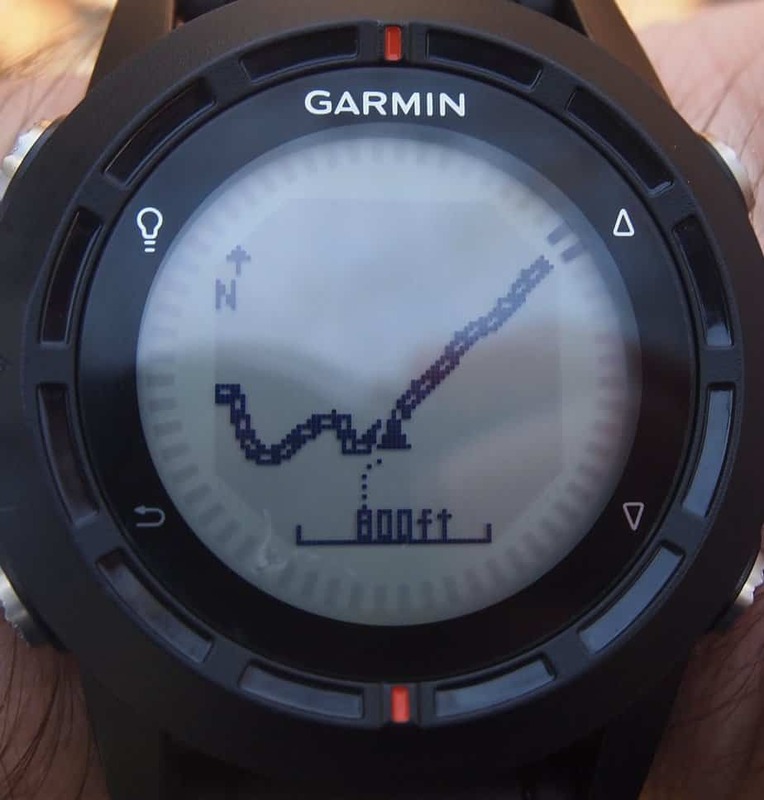 But what I really like about the watch is its large screen and bread-crumb map. 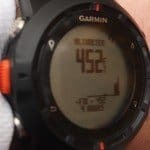 When I casually bought my Forerunner 405 a few years ago, I was surprised to learn it lacked the bread-crumb map I’d grown accustomed to on my 305. I love exploring new running routes. 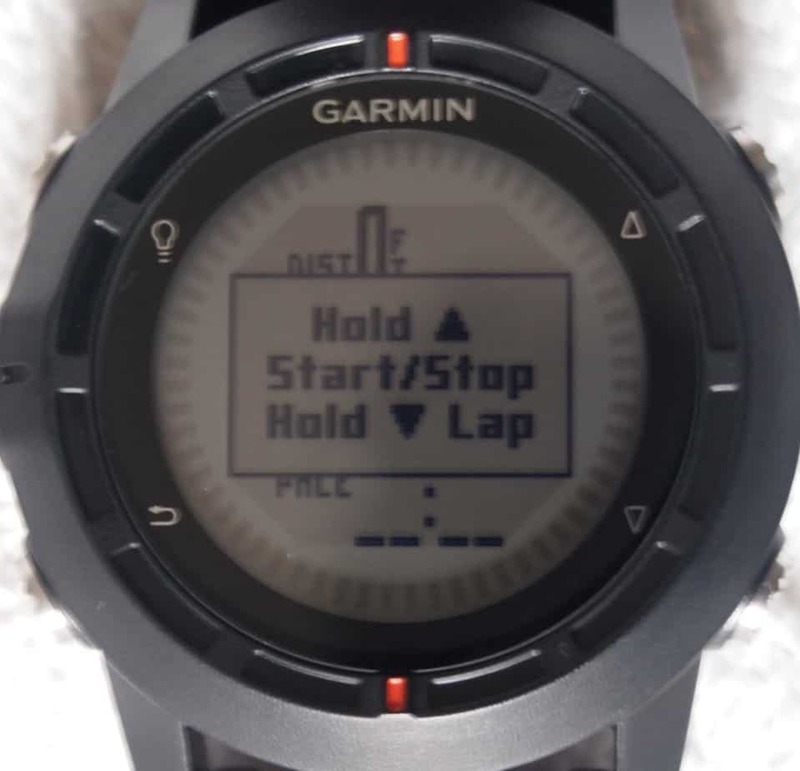 Borrowing or creating a route on Garmin Connect and uploading it my watch is a great way to test new routes without fear of getting lost. Seeing the bread-crumb map back on a sport-style watch was a welcome sight. The large screen also means easy-to-read data fields. 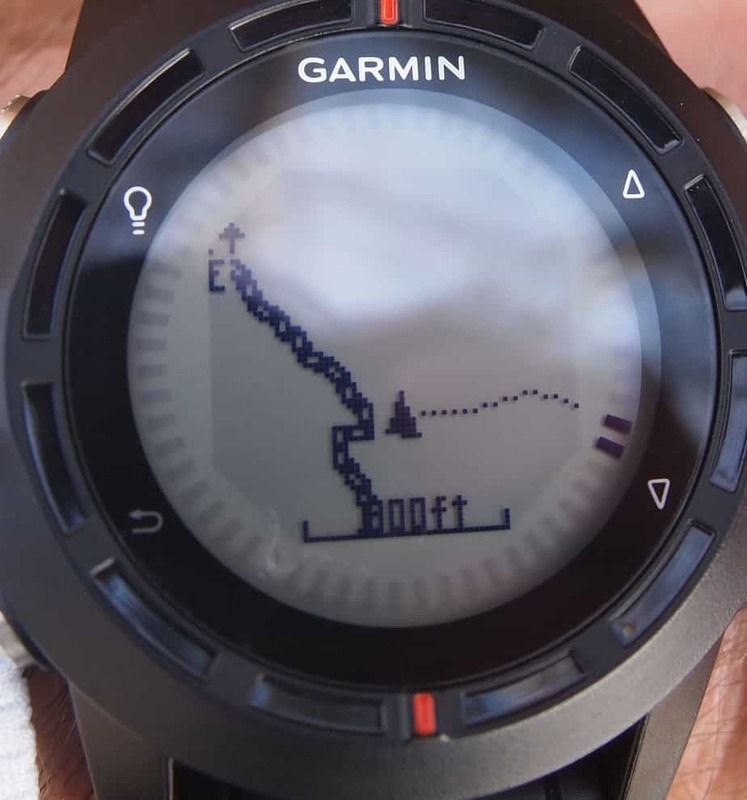 It’s a feature I appreciate as I take a quick glance at the fenix – halfway up, 600 vertical feet in total – my heart rate is steady at 180 bpm. From Garmin’s website, here are the things you can do with the fenix: camping, hunting, hiking, running, geocaching, off-roading, cycling, and boating. Waypoints. 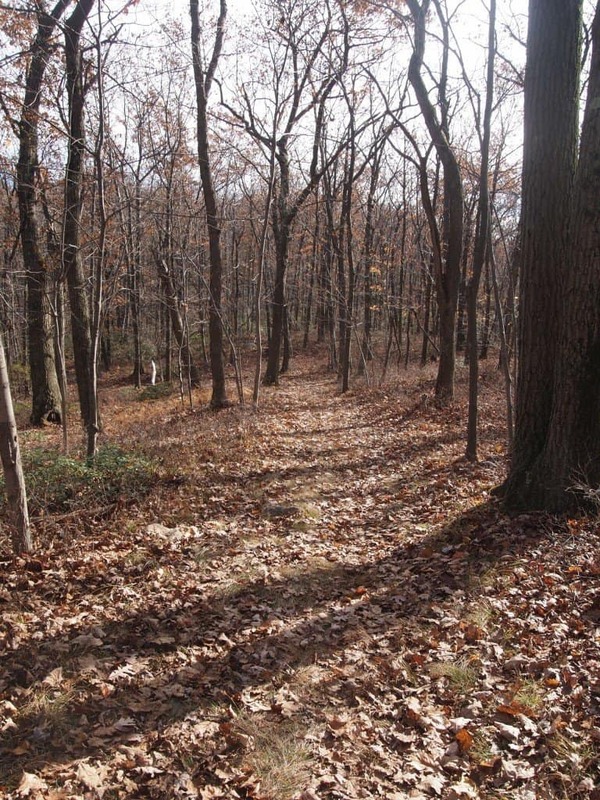 Up to 1,000 to mark landmarks, trailheads, campsites. Sunrise/Sunset times, as well as the best hunting and fishing times. 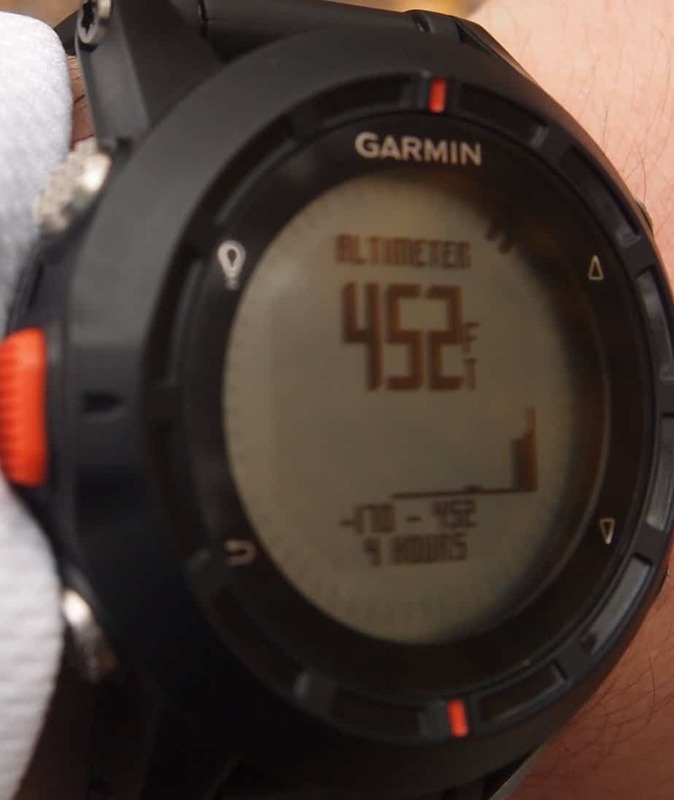 Built-in altimeter, barometer, compass, and thermometer. Heart rate monitor and bike speed and cadence sensor support. 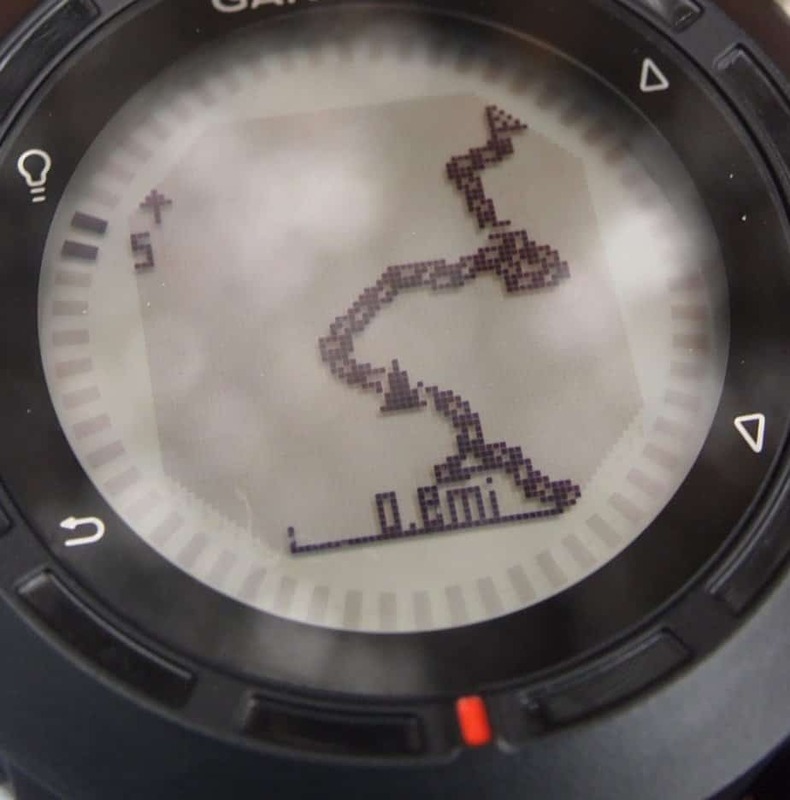 Compatibility with “Chirp,” Garmin’s new geocaching tool. 13:10. My current minute/mile pace. Pretty bad until I consider I’m climbing a 10% grade, 17 minutes into my workout. Here is some other information from the fenix: 0.87 total miles. Elevation: 843 feet. 185 HRM. 152 calories burned. Ultimately, this is all you get with the fenix. Basic running data. If I was wearing a foot pod, I could tell you my cadence. We categorize the fenix as a beginner’s watch because it lacks any extensive training features. I would have liked to program a workout into the fenix, but it doesn’t have that. It doesn’t even have interval workouts. Virtual Partner is a recently added feature but it’s not as intuitive as on the Forerunner series. But as a basic running GPS watch, the fenix is fine. Given all the other features it comes with, it’s a spectacular watch. The fenix beeps as I reach the 2 mile point. I hadn’t bothered to update auto lap – the fenix comes with auto lap defaulted to 1 mile. This can be modified or turned off as needed. 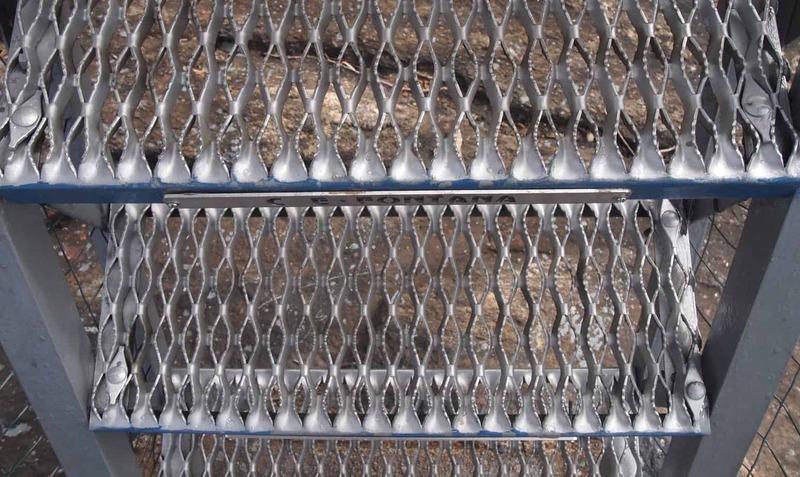 As for instant pace – a common complaint among runners – the fenix is average. The needle jumps but not so much that you can’t roughly determine how fast you are running. I stop and take in my surroundings. It’s cool and the sun feels good as it warms my skin. The trees are just starting to change. I can catch a glimpse of the Hudson River through the branches. 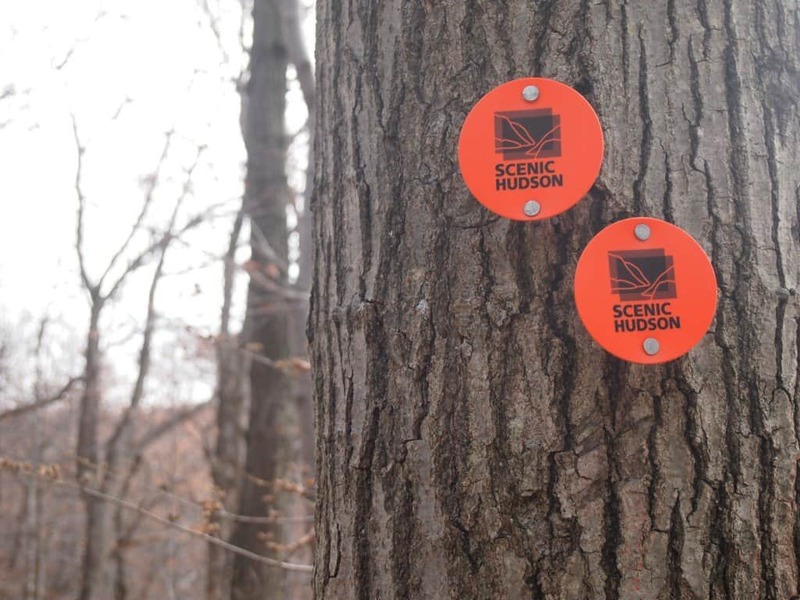 A red tag marks a nearby tree. It’s time to start the hiking part of my workout. Before starting my run/hike, I took a few minutes to plan my route on Garmin Connect. One of my favorite features on the fenix is the bread-crumb map. While rudimentary, I love being able to follow a pre-planned route. It helps me find new places to run without the fear of getting lost or making a wrong turn. But this leads me to my biggest gripe about the fenix. 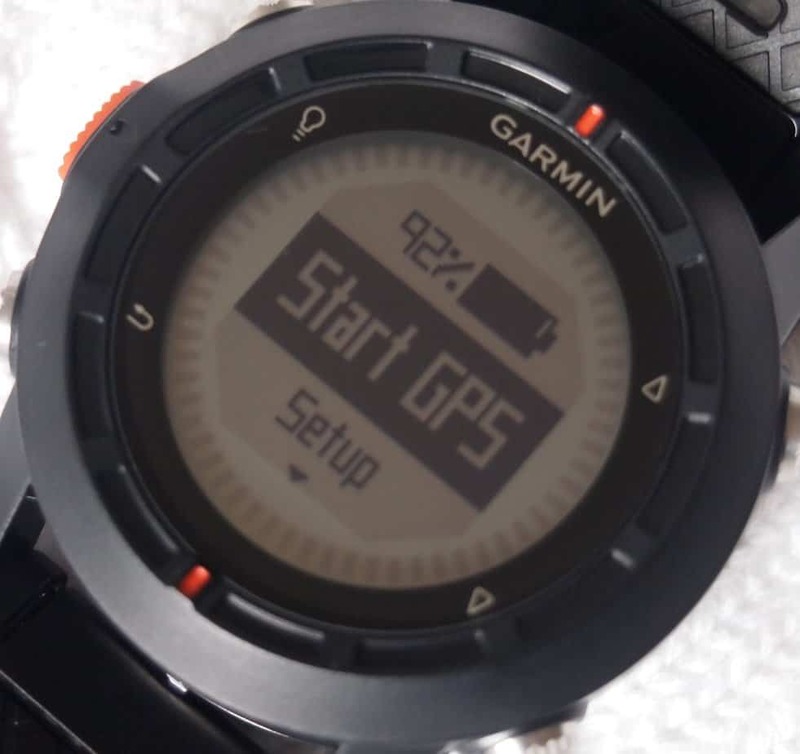 Really, it’s a Garmin gripe aimed squarely at their Basecamp program. 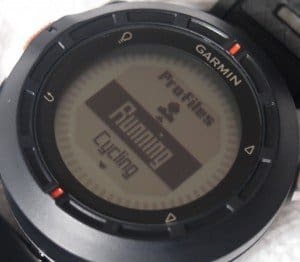 The idea of Basecamp is to plan routes and load them onto the fenix (or other Garmin device, Basecamp is also used for other non-sporting Garmin gadgets). Waypoints can be added to denote campsites, bathrooms, or other places of interest. For the fenix, Basecamp is Garmin’s default software application as opposed to Garmin’s Training Center software for Forerunners. The problem is that it comes with a basically useless built-in map. There is no topographical information and virtually no roads. Garmin’s great idea is that you should cough up an additional $90-$100 to add detailed maps. And it’s not even a one-time charge, each map only covers a specific geographical region. Want more maps? Prepare to pay up. 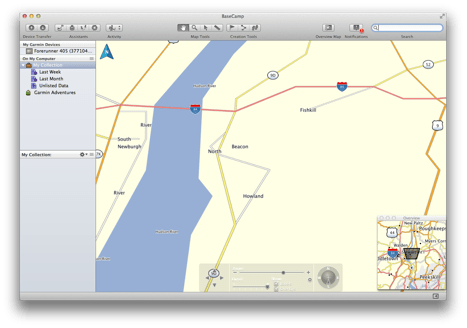 The good news is that Garmin Connect is free and based off a detailed Google map. You can create a route and upload it to the watch. So what’s missing? The most obvious is you can’t add waypoints. 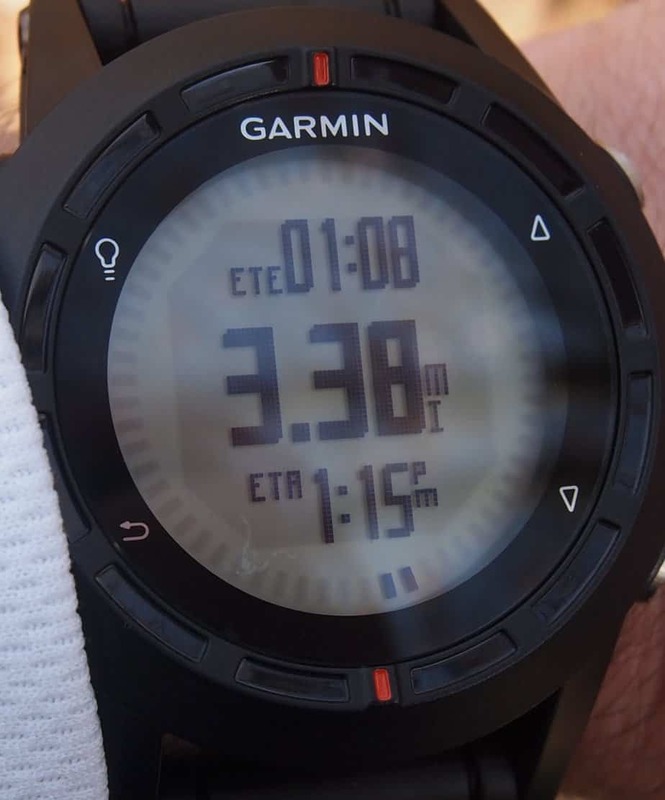 Otherwise, from a running and casual hiking perspective, Garmin Connect works fine. So I drew up a quick course, loaded it onto the fenix, and now, halfway into my workout, I can see exactly where I am along the course. If I had a friend with his or her own fenix, we could share the course wirelessly. I couldn’t test this feature as I didn’t have a friend or second fenix. But the feature is there. This is where the fenix’s navigational features start to shine. 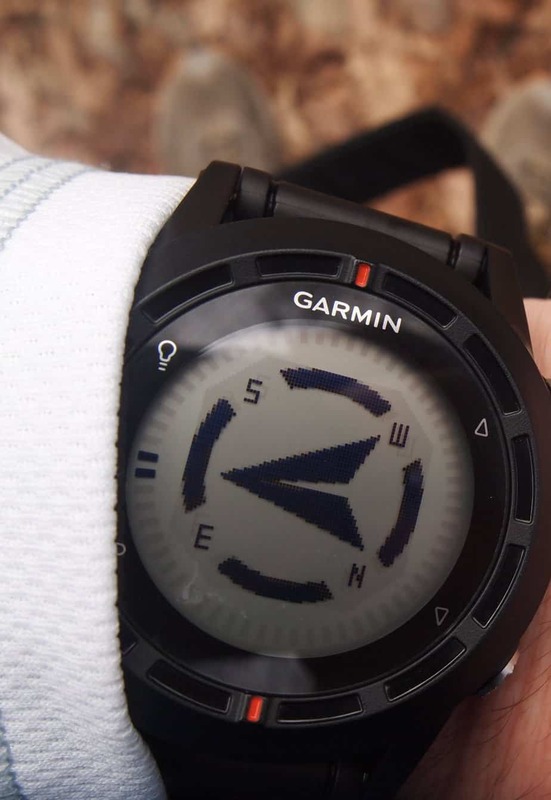 In addition to the bread-crumb route, there is a compass, and a screen with an arrow pointing the direction to follow the route. 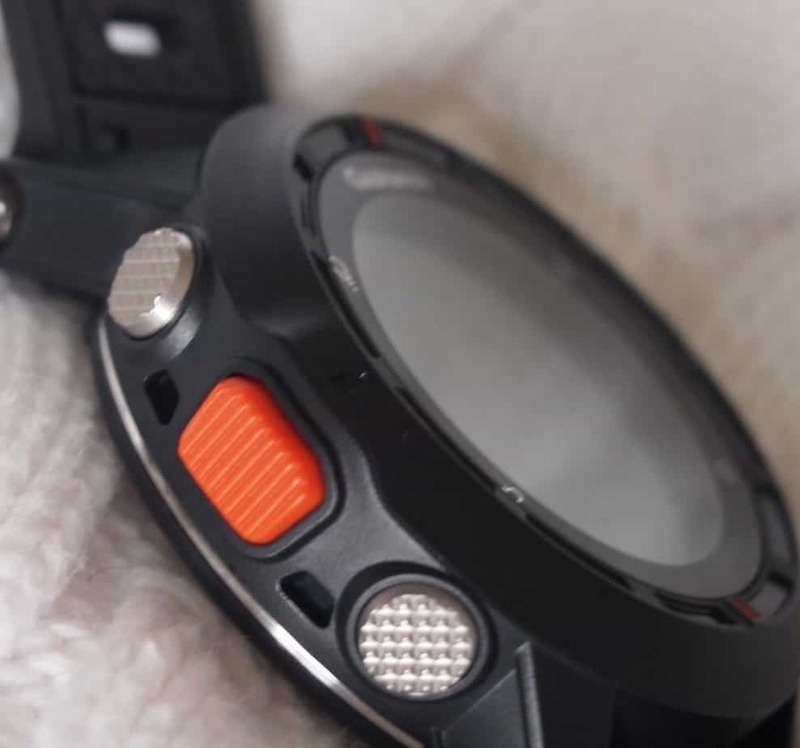 There’s also two little dots along the perimeter of the watch, available on every screen, that also point the direction to follow . And with the barometric altimeter, I have accurate elevation readings. 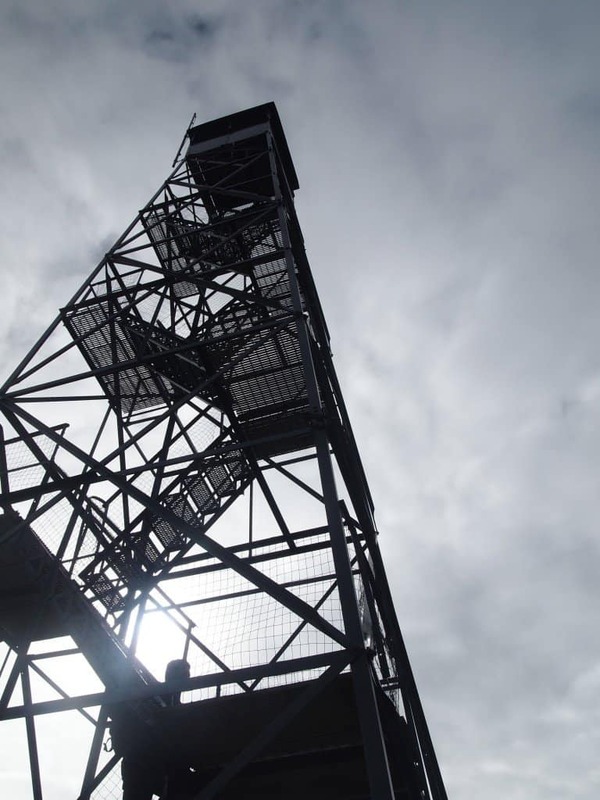 I’ve just about made it to the fire tower atop North Mt Beacon. I’ve been hiking for 45 minutes. Looking behind me, the Hudson River stretches 180 degrees north and south. The Beacon-Newburgh bridge, rusty and stained, juts high above the water. A freight train slowly chugs along on the Newburgh side of the river. I thought about climbing the tower – but seeing it perched above a rocky outcropping with see-through, metal-grate steps – a rational fear of heights kicks in. But I’m about to do something even stupider. There’s an unmarked trail nearby, off my uploaded route. Without a second thought, I head down it. 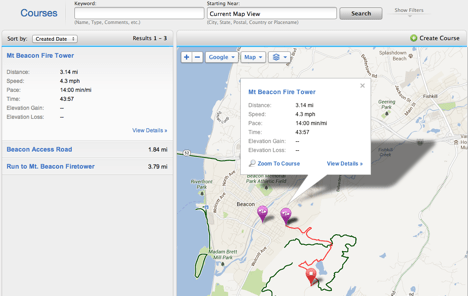 I’m not completely crazy, just testing out the fenix’s other nice hiking feature: Trackback. Selecting this function at the mid-point of an out-and-back will instantly provide a navigational guide back to where I started. This includes an arrow to direct me, the bread-crumb map to see the route, and, what’s really cool, an estimated time of arrival based on my current pace. But I’m heading off the beaten track to test this even further. Trackback will point you back to where you deviated off course. And if I were to miraculously find a short-cut (which I was attempting to do now) and get back on my original course, it updates to continue backtracking on the original course.15 minutes later, my gamble pays off. I emerge back on the original trail. ETA to home: 12 minutes. Back at my car, I take a deep breath and review my run/hike. Not a bad way to spend the afternoon. My bike is currently out of commission, but I could get a good sense of how the fenix would operate while riding a bike. Basically, it’s fine. There is no dedicated bike mount, although you can purchase this handy piece of foam to wrap the watch around your handlebars. 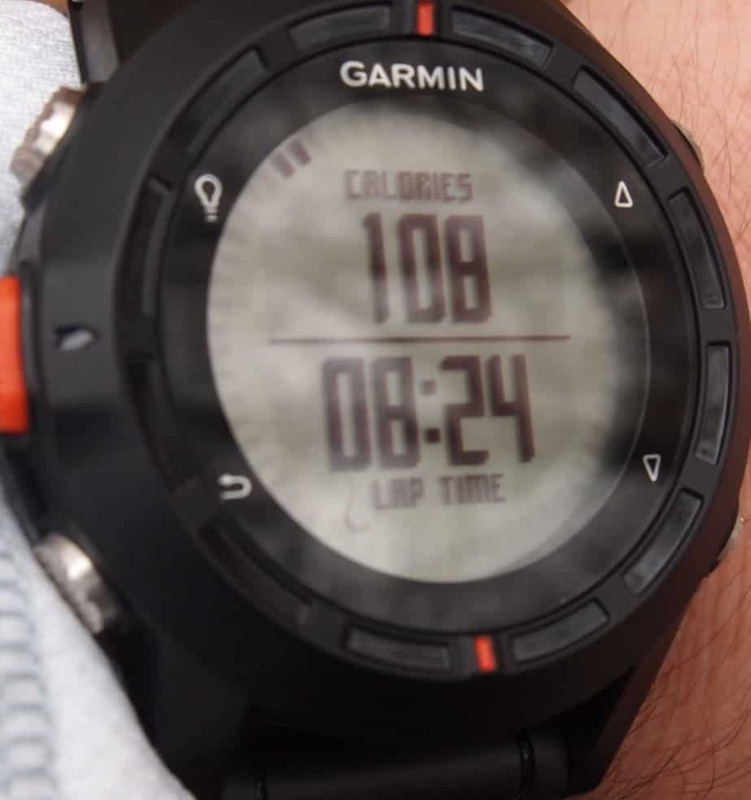 The reason Garmin advertises this as a cycling watch is because it’s compatible with a speed and cadence sensor. This little gadget will track distance and speed if satellite reception is lost. And like the foot pod, it measure pedal cadence. Overall, the fenix tracks basic cycling stats. It’s fine. But not the watch you wan to purchase if you do a lot of cycling. 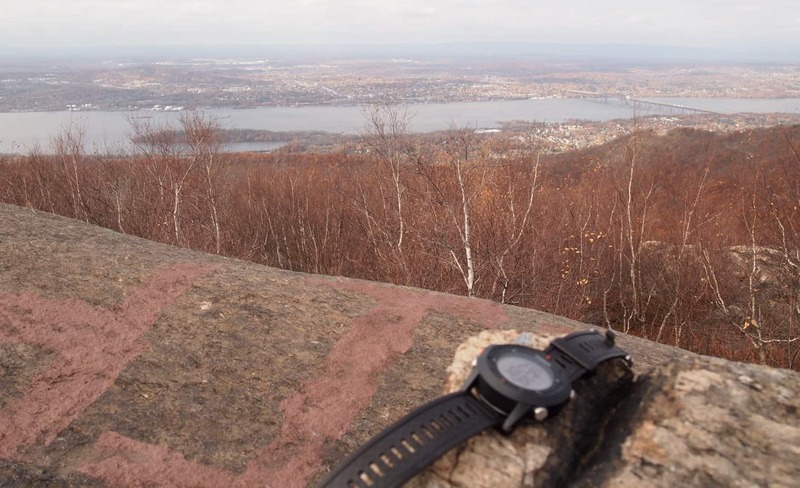 I’m pretty happy with the fenix as a running and hiking watch. 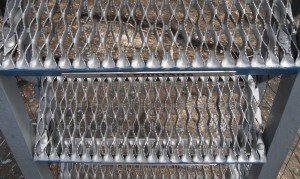 It excels hiking, and since I do a lot of trail running, I find those features useful when I’m on the trails. I love its navigational features and I’m very impressed with the elevation readings from the barometric-altimeter. As a road running watch, I found the fenix to be average. It did the job but offered none of the benefits of a dedicated running or triathlon watch. 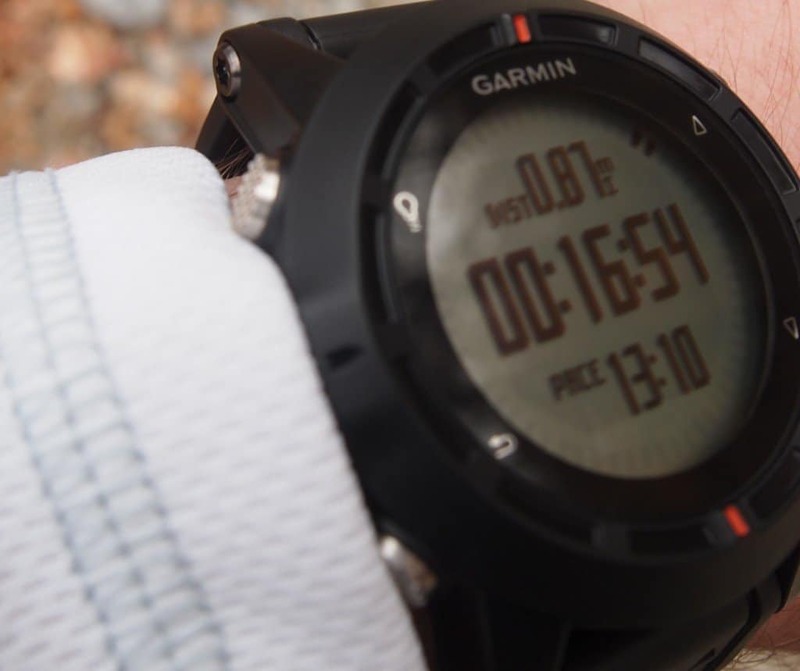 Even the Forerunner 10, Garmin’s most basic GPS watch, has pacing features more advanced than what’s on the fenix. Its accessory support – heart rate monitor, foot pod, and bike speed and cadence sensor – is nice, but feels more like an add-on rather than an intuitive part of the watch. So who is the fenix best for? Hikers, definitely. 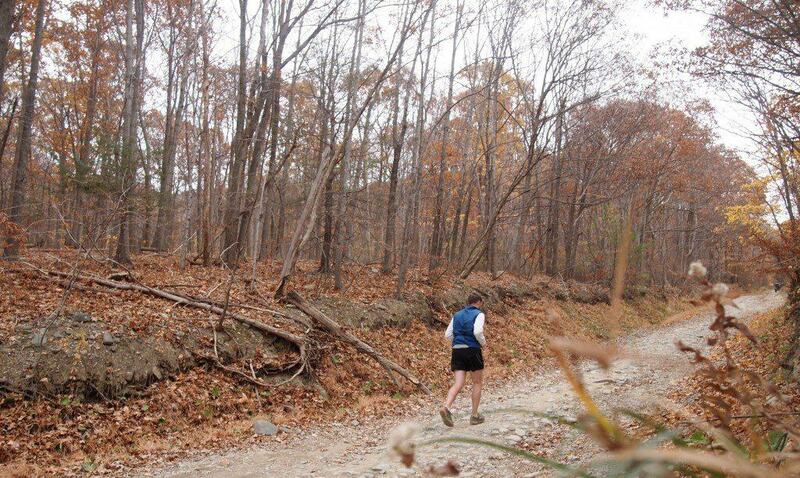 Trail runners, yes. And runners, cyclists, and triathletes? Only if those aren’t your main activities. Want more? Check out all of the fenix’s features here.